Whether you need a simple operator interface or a complex control environment for a machine with multiple input points, Kollmorgen Automation Suite™ includes HMI panels that are simple to program with the display and input capabilities you need for practically any job. For information about HMI software and sample projects, see Kollmorgen Visualization Builder (KVB). 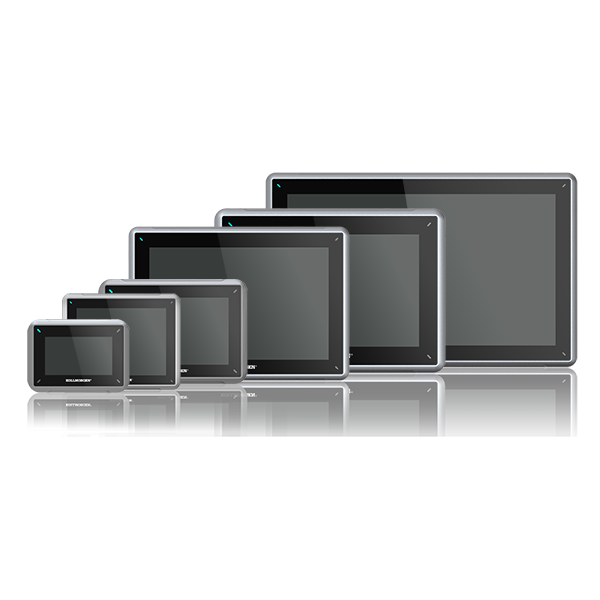 AKI2G operator panels offer wide screen format, designed to succeed the traditional 4:3 square aspect ratio. Available in corrosion resistant plastic housing with IP65 front or robust aluminum housing powdered coated gray with IP65, NEMA 4X/12 and UL Type 4X/12 front. Both resistant to direct rain, snow or wash-downs, dirt, grime and dust. Choice of power efficient ARM9 processor that provides strong performance for small and medium sized applications or powerful ARM A9 processors available in single or dual core ARM Cortex-A9 processor delivering fast screen changes and program execution in demanding applications. High-resolution TFT-LCD with LED backlight displays ensure good visibility at wide viewing angles under almost any lighting conditions. Migration tables to find the right panel when you want to upgrade your existing Kollmorgen HMI solution to the new AKI operator panels.